Astronaut photograph ISS053-E-2095 was acquired on September 3, 2017, with a Nikon D4 digital camera using a 210 millimeter lens and is provided by the ISS Crew Earth Observations Facility and the Earth Science and Remote Sensing Unit, Johnson Space Center. The image was taken by a member of the Expedition 53 crew. The image has been cropped and enhanced to improve contrast, and lens artifacts have been removed. The International Space Station Program supports the laboratory as part of the ISS National Lab to help astronauts take pictures of Earth that will be of the greatest value to scientists and the public, and to make those images freely available on the Internet. Additional images taken by astronauts and cosmonauts can be viewed at the NASA/JSC Gateway to Astronaut Photography of Earth. Caption by Andrea Meado, Jacobs Technology, JETS Contract at NASA-JSC. An astronaut aboard the International Space Station shot this photograph of Michigan’s Upper Peninsula. Morning sunglint silhouettes Lake Superior’s shoreline and highlights smaller lakes and mine tailings ponds on the land. 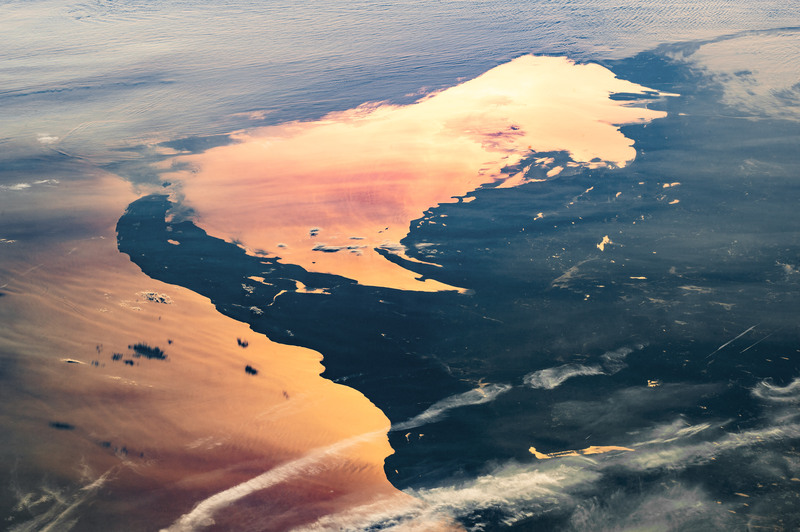 The subdued, orange sunglint and hazy atmosphere may be due to wildfires that occurred in August 2017 throughout the northwestern United States and parts of Canada. Smoke particles in the atmosphere can cause the scattering of light waves and create pale orange-red hues at dusk or dawn, when Sun elevation is low relative to the local horizon. The Upper Peninsula has long been known for its copper and iron resources, with native peoples mining Keweenaw copper as far back as 7,000 years ago. Modern iron mining began in the Upper Peninsula in 1845, with the Tilden Mine still in production today. Logging was also prevalent in the Upper Peninsula from the mid-1800s to about 1900. Trees were cut in the winter and brought to rivers by sleigh. In spring time, when snowmelt fed the rivers, timber was floated downstream to be sorted. These logs were marked with axe-cut symbols—similar to cattle branding—to avoid confusion about ownership as the logs floated to lake ports. This extensive logging left much of the Upper Peninsula without trees. In 1931, the Hiawatha and Ottawa National Forests were established in the area to promote reforestation, scientific forestry, and the protection of wildlife, soil, and water resources. Today, fishing in lakes and streams is a popular activity for locals and tourists. Lake Superior, Earth’s largest freshwater lake by surface area, can be fished year round, including ice fishing in the winter.